The Community of Madrid (English: /məˈdrɪd/; Spanish: Comunidad de Madrid Spanish pronunciation: [komuniˈðað ðe maˈðɾið] ( listen)) is one of the seventeen autonomous communities of Spain. It is located in the centre of the Iberian Peninsula, and of the Castilian Central Plateau (Meseta Central). Its capital is the city of Madrid, which is also the capital of the country. The Community of Madrid is bounded to the south and east by Castilla–La Mancha and to the north and west by Castile and León. It was formally created in 1983, based on the limits of the province of Madrid, which was until then conventionally included in the historical region of New Castile. The Community of Madrid is the third most populous in Spain with 6,549,979 (2018) inhabitants mostly concentrated in the metropolitan area of Madrid. It is also the most densely populated autonomous community. In absolute terms, Madrid's economy is roughly equal in size to that of Catalonia, which remains Spain's largest. Madrid thus has the highest GDP per capita in the country. ✪ Aerial view of Madrid city - Spain. Despite the existence of a large city of 5 million people, the Community of Madrid still retains some remarkably unspoiled and diverse habitats and landscapes. Madrid is home to mountain peaks rising above 2,000 m, holm oak dehesas and low-lying plains. The slopes of the Guadarrama mountain range are cloaked in dense forests of Scots pine and Pyrenean oak. The Lozoya Valley supports a large black (monk) vulture colony, and one of the last bastions of the Spanish imperial eagle in the world is found in the Park Regional del Suroeste in dehesa hills between the Gredos and Guadarrama ranges. The recent possible detection of the existence of Iberian lynx in the area between the Cofio and Alberche rivers is testament to the biodiversity of the area. Taking advantage of the orography, there are several reservoirs and dams in th region, with the Santillana reservoir being the largest. Peñalara: The Guadarrama mountain range's highest peak. 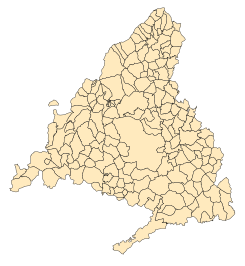 When looking at a map of the Province of Madrid, it can be seen that it is almost an equilateral triangle, in whose center would be the city. First, by the western side, the region borders the "Sistema Central" (the Guadarrama mountain range), the southern border features a protrusion following the Tagus River in order to include the royal site of Aranjuez in the region; the eastern edge of the triangle comes from the rupture of the fluvial river basins. The region also includes the exclave of Dehesa de la Cepeda (part of the municipality of Santa María de la Alameda), a mostly open-area geographically located between the provinces of Ávila and Segovia in the autonomous community of Castile and León. Practically all of the Province is located between 600 and 1,000 m above sea level, with the highest point being Peñalara at 2,430 m and the lowest the Alberche river in Villa del Prado at 430 m. Other considerable heights, as well as being famous, are the Ball of the World mountain (la Bola del Mundo) in Navacerrada, at a height of 2,258 m and the seven peaks in Cercedilla, at 2,138 m.
The territory of the Community of Madrid has been populated since the Lower Paleolithic, mainly in the valleys between the rivers of Manzanares, Jarama, and Henares, where several archaeological findings have been made. Some notable discoveries of the region the bell-shaped vase of Ciempozuelos (between 1970 and 1470 BCE). During the Roman Empire, the region was part of the Citerior Tarraconese province, except for the south-west portion of it, which belonged to Lusitania. It was crossed by two important Roman roads, the via xxiv-xxix (joining Astorga to laminium and via xxv (which joined Emerita Augusta and Caesaraugusta), and contained some important conurbations. The city of Complutum (today Alcalá de Henares) became an important metropolis, whereas Titulcia and Miaccum were important crossroad communities. During the period of the Visigothic Kingdom, the region lost its importance. The population was scattered amongst several small towns. Alcalá de Henares was designated the bishopric seat in the 5th century by orders of Asturio, archbishop of Toledo, but this event was not enough to bring back the lost splendor of the city. The fortress of Mayrit (Madrid) was built somewhere between 860 and 880 AD, as a walled precinct where a military and religious community lived, and which constituted the foundation of the city. It soon became the most strategic fortress in defense of the city of Toledo above the fortresses of Talamanca and Qal'-at'-Abd-Al-Salam (Alcalá de Henares). In 1083 (or 1085) Alfonso VI took the city of Madrid in the context of his wider campaign to conquer Toledo. Alcalá de Henares fell in 1118 in a new period of Castilian annexation. In the 13th century, Madrid was the only city of the region that preserved its own juridical personality, at first with the Old Fuero (Charter) and later with the Royal Fuero, granted by Alfonso X of Castile in 1262 and ratified by Alfonso XI in 1339. On the other hand, the town of Buitrago del Lozoya, Alcalá de Henares and Talamanca de Jarama, which were rapidly repopulated until that century, were under the dominion of the feudal or ecclesiastical lords. Specifically, Alcalá de Henares was under the hands of the archbishopric of Toledo and remained so until the 19th century. Madrid was in constant strife with the powerful council of Segovia, whose jurisdiction extended south of the Guadarrama Mountains; they both fought for the control of the Real de Manzanares, a large comarca (shire) that was finally given to the House of Mendoza. Panoramic view of Madrid, a 16th century work by Anton van den Wyngaerde. Castilian monarchs showed a predilection for the center of the peninsula, with abundant forests and game. El Pardo was a region visited frequently by kings since the time of Henry III, in the 14th century. The Catholic Monarchs started the construction of the Royal Palace of Aranjuez. [dubious – discuss][citation needed] In the 16th century, San Lorenzo de El Escorial was built and became another royal site of the province. The town of Madrid, which was one of the eighteen cities with the right to vote in the Cortes of Castile, was seat of the Courts themselves on several occasions and was the residence of several monarchs, amongst them the emperor Charles I who reformed and expanded the Alcázar or Castle of the city. Alcalá de Henares grew in importance as cultural center since the foundation by the Cardinal Cisneros of its university. Philip II supervises the works on El Escorial, by Luca Giordano. In 1561, King Philip II made Madrid the capital of the Hispanic Monarchy. The surrounding territories became economically subordinated to the town itself, even beyond the present day limits of the Community of Madrid. But it was not a unified region as several lords and churches had jurisdiction over their own autonomous territories. During the 18th century, the fragmented administration of the region was not solved despite several attempts. During the reign of Philip V, the intendencia was created as a political and administrative division. Nonetheless, the intendencia of Madrid did not fully solve the problem, and the region was still fragmented into several small dominions even though some processes were centralized. This territorial dispersion had a negative effect on its economic growth; while the town of Madrid received economic resources from the entire country as the capital, the surrounding territories—in hands of noblemen or the clergy—became impoverished. The current territory of the region was roughly defined with the 1833 reorganization of Spain into provinces promoted by Javier de Burgos, in which the province of Madrid was classified in the region of New Castile (lacking any sort of administrative institution at the regional level nonetheless). The government institution at the provincial level was the deputation (diputación). In addition to the former body, another provincial political authority was the civil governor discretionarily designated by the central government. A modest change of the 1833 provincial boundaries that concerned Madrid took place in 1850, when the small municipality of Valdeavero (19 km2), until then part of the province of Guadalajara, joined the province of Madrid. In the process whereby democracy was restored in Spain between 1975 and 1978, the nationalist and regionalist parties pressed to grant home rule to certain territories in Spain. The constitution of 1978 opened a legal way for autonomous communities to be formed from provinces with common historical and cultural links. Even though the province of Madrid belonged to the cultural and historical region of Castile, the other provinces refused to include Madrid in their autonomic developments and, finally, it was granted autonomy as a single-province community by means of the 144th article of the constitution which declared an exception to the aforementioned rule in the creation of autonomous communities if it was the "nation's interest." The Community of Madrid was created in 1982 after the elaboration of a Statute of Autonomy, later approved by the General Courts of Spain. A meeting of the current Council of Government presided by Ángel Garrido. All autonomous communities are organized politically within a parliamentary system; that is, the executive branch of government—known as "president" in the case of the Community of Madrid—is dependent on the direct support of the legislative power, whose members elect him by majority. The Assembly of Madrid, a directly elected body, represents the people of Madrid and exercises the legislative power of the community in approving and supervising the budget and in coordinating and controlling the actions of the government. The seat of the Assembly is located in Madrid, in the district of Puente de Vallecas. The members of the legislature (currently 129) are elected through proportional representation with closed-party lists and a 5% electoral threshold in a single region-wide constituency. The elections follow the normal electoral calendar set for most autonomous communities (with the exception of Catalonia, the Basque Country, Galicia, and Andalusia). The only exception to this occurred in 2003, in which due to the refusal of two socialist deputies to follow party discipline after the May election prevented the formation of any government. Therefore, new elections were held in October, outside the established electoral calendar. The last election took place on 24 May 2015. The next election is scheduled to be held on 26 May 2019. The President of the Community of Madrid is the supreme representative of the region and the ordinary representation of the State. It presides and heads the activities of the regional government, designates and dismisses the vice-presidents and the ministers (consejeros) which conform an executive cabinet. The investiture of the regional president, who is nominated as candidate by the Speaker of the Assembly among its members after holding consultations, is voted by a qualified majority of the plenary of the legislature and then formally appointed by the King through a Royal Decree. The seat of the Presidency is the Real Casa de Correos located at the Puerta del Sol at the center of Madrid. Since 2018, the regional president is Ángel Garrido, of the People's Party (PP). The Government of the Community of Madrid is the collegiate body that heads the politics and the executive and administrative powers of the community. The incumbent Council of Government comprises the President, the Vice-President (assuming additional competences) and seven more ministers. Since the creation of autonomous communities, the Government of Spain appoints a special representative to the region, the Government Delegate, part of the Peripheral State Administration. Unlike other single-province autonomous communities, the Government also appoints the Government Sub-delegate, the successor office to the provincial civil governor. The seats of both the delegation and the subdelegation are located at the Borghetto Palace in Madrid. The Community of Madrid, following the long-standing form of local government in Spain, is divided administratively into 179 municipalities (featuring 801 towns and entities). Its municipalities comprise 2.2% of the Spanish territory (8110). It is ranked 23rd amongst Spanish provinces in number of municipalities, which is slightly above average.[n. 1] The average is 165 municipalities by province. The ayuntamiento, presided by its alcalde (Mayor) is the formal institution charged with the government and administration of most municipalities. The municipal councillors forming the deliberative assembly of the ayuntamiento are directly elected through proportional representation with closed party lists and a 5 % electoral threshold. In turn, the councillors are charged with electing from among themselves (by default candidates are the head of each electoral list) the Mayor presiding over the ayuntamiento. There are twenty judicial districts (partidos judiciales), whose seats correspond to the municipalities of Alcalá de Henares, Alcobendas, Alcorcón, Aranjuez, Arganda del Rey, Collado Villalba, Colmenar Viejo, Coslada, Fuenlabrada, Getafe, Leganés, Madrid, Majadahonda, Móstoles, Navalcarnero, Parla, San Lorenzo de El Escorial, Torrejón de Ardoz, Torrelaguna, Valdemoro and Valdaracete (the historical judicial district of San Martín de Valdeiglesias is no longer a judicial district as of 1985). These jurisdictions relate to the judicial administration, with their seat having at least one court of first instance. Madrid is the autonomous community with the highest income per capita in Spain at €31,004 in 2014 - significantly above the national average and ahead of the Basque Country (€29,683), Navarra (€28,124) and Catalonia (€26,996). In that year, the GDP growth was 1.0%. Madrid has a GDP of €219.8 billion as of 2009; this is second in Spain only to Catalonia, where regional GDP amounted to €230.4 billion but ahead of the largest Spanish region, Andalucia (€167.4 billion). In 2005, the Community of Madrid was the main receptor of foreign investment in the country, at 34.3% of the total. The community ranks 34th amongst all European regions (evaluated in 2002), and 50th amongst the most competitive cities-regions worldwide, ahead of Barcelona and Valencia, the other two largest metropolitan areas of Spain. The strengths of the economy of the community are its low unemployment rate, its high investment in research, its high development, and the added-value services therein performed. Its weaknesses include the low penetration of broadband and new technologies of information and an unequal male to female occupation. The Community of Madrid is the third most populous in Spain, after Andalusia and Catalonia, and the most populous province, with 6,369,167 inhabitants. Population density is 779.36 hab/km2, much higher than the national average of 91.3 hab/km2. Population density varies with the community itself; the municipality of Madrid has a density of 5,160.57 hab/km2, whereas the Sierra Norte has a population density of less than 9.9 hab/km2. The vast majority of the population lives in the capital and its metropolitan area, which is the most populated in Spain. Madrid also has the greatest population density in Spain. 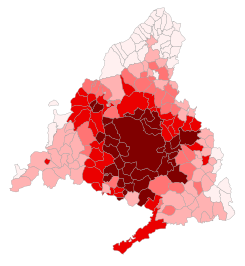 Its inhabitants are mainly concentrated in the capital (which is the Spanish city with the highest resident population) and in a series of municipalities (Móstoles, Alcalá de Henares, Fuenlabrada, Leganés, Alcorcón, Getafe, Torrejón de Ardoz, and Alcobendas), as opposed to in rural areas with low population density. Its citizens have diverse origins, and Madrid is the province with the highest number of residents born outside its territory and with the largest foreign population (13.32%). It is a focus of attraction for those migrating for reasons of employment. Population growth in Madrid is mainly due to the arrival of foreigners. The Community of Madrid is the EU-Region with the highest average life expectancy at birth. The average life expectancy was 82.2 years for males and 87.8 for females in 2016. Spanish students aged six to sixteen undergo primary and secondary school education, which are compulsory and free of charge. Successful students are awarded a Secondary Education Certificate, which is necessary for entering further (optional) education as is Bachillerato for their University or Formacion Professional (vocational studies). Once students have finished their Bachillerato, they can take their University Entrance Exam (Pruebas de Acceso a la Universidad, popularly called Selectividad) which differs greatly from region to region. The Complutense University of Madrid is one of the most prestigious, and the largest, university in Spain and one of the oldest universities in the world. It has 10,000 staff members and a student population of 117,000. Nearly all academic staff are Spanish. It is located on two campuses, in the university quarter Ciudad Universitaria at Moncloa in Madrid, and in Somosaguas. The Complutense University of Madrid was founded in Alcalá de Henares, old Complutum, by Cardinal Cisneros in 1499. Nevertherless, its real origin dates back from 1293, when King Sancho IV of Castile built the General Schools of Alcalá, which would give rise to Cisnero's Complutense University. During the course of 1509-1510 five schools were already operative: Artes y Filosofía (Arts & Philosophy), Teología (Theology), Derecho Canónico (Canonical Laws), Letras (Liberal Arts) and Medicina (Medicine). In 1836, during the reign of Isabel II, the University was moved to Madrid, where it took the name of Central University and was located at San Bernardo Street. Subsequently, in 1927, a new University City ("Ciudad Universitaria") was planned to be built in the district of Moncloa-Aravaca, in lands handed over by the King Alfonso XIII to this purpose. The Spanish Civil War turned the University City into a war zone, causing the destruction of several schools in the area, as well as the loss of part of its rich scientific, artistic and bibliographic heritage. In 1970 the Government reformed the High Education, and the Central University became the Complutense University of Madrid. It was then when the new campus at Somosaguas was created in order to house the new School of Social Sciences. The old Alcalá campus was reopened as the independent University of Alcalá in 1977. Another important university is the Autonoma, perhaps Spain's best university for research along with the Complutense, was instituted under the leadership of the famous physicist, Nicolás Cabrera. The Autonoma is widely recognised for its research strengths in theoretical physics. Known simply as la Autónoma in Madrid, its main site is the Cantoblanco Campus, situated 15 kilometers to the north of the capital (M-607) and close to the municipal areas of Madrid, namely Alcobendas, San Sebastián de los Reyes, Tres Cantos and Colmenar Viejo. Located on the main site are the Rectorate building and the Faculties of Science, Philosophy and Fine Arts, Law, Economic Science and Business Studies, Psychology, Higher School of Computing Science and Engineering, and the Faculty of Teacher Training and Education. The Medical School is located outside the main site and beside the Hospital Universitario La Paz. Other local universities, among many others, are the Technical University of Madrid, as the result of merging the different Technical Schools of Engineering; the Universidad de Alcalá de Henares, founded in 1499; the Carlos III, whose philosophy is to create responsible free-thinking people with a sensitivity to social problems and an involvement in the concept of progress based on freedom, justice and tolerance and the Universidad Pontificia Comillas, involved in a number of academic exchange programmes, work practice schemes and international projects with over 200 Higher Education Institutions in Europe, South America, North America, and Asia. Other universities in Madrid: Rey Juan Carlos University (public), Universidad Alfonso X, Universidad Antonio de Nebrija, Universidad Camilo José Cela, Universidad Francisco de Vitoria, Universidad Europea de Madrid, and Universidad San Pablo (all of them private). Madrid is also home to the Escuela Superior de Música Reina Sofía, the Real Conservatorio Superior de Música de Madrid, and many other private educational institutions. Madrid is served by Barajas International Airport. Barajas is the main hub of Iberia Airlines and consequently serves as the main gateway to the Iberian peninsula from Europe, the Americas, and the rest of the world. Current passenger volumes range upwards of 52 million passengers per year, putting it in the top 10 busiest airports in the world. Given annual increases close to 10%, a new fourth terminal has been constructed. It has significantly reduced delays and doubled the capacity of the airport to more than 70 million passengers per year. Two additional runways have also been constructed, making Barajas a fully operational four-runway airport. Cercanías Madrid is the commuter rail service that serves Madrid, the capital of Spain, and its metropolitan area. It is operated by Cercanías Renfe, the commuter rail division of RENFE, the former monopoly of rail services in Spain. The system is infamous for being the target of 11 March 2004 Madrid train bombings. The attacks triggered a small reduction in the ridership of the system, but it is still the most used and most profitable (by 2004) of the commuter rail services in Spain. The total length spans 339.1 km. The crown jewel of Spain's next decade of infrastructure construction is the Spanish high-speed rail network, Alta Velocidad Española AVE. Currently, an ambitious plan includes the construction of a 7,000-kilometre (4,300 mi) network, centered on Madrid. The overall goal is to have all important provincial cities be no more than four hours away from Madrid and no more than six hours away from Barcelona. As of 2008, AVE high-speed trains link Atocha station to Seville, Málaga, and Toledo in the south and to Zaragoza, Tarragona, and Barcelona in the east. AVE trains also arrive to Segovia and Valladolid. Serving the city's population of some six million, the Madrid Metro is one of the most extensive and fastest-growing metro networks in the world. With the addition of a loop serving suburbs to Madrid's south-west "Metrosur", it is now the second largest metro system in Western Europe, second only to London's Underground. In 2007, Madrid's metro system was expanded, and it currently runs over 322 kilometers (200 mi) of line. The province of Madrid is also served by an extensive commuter rail network called Cercanías. Metro fees are regulated by the Consorcio Regional de Transportes de Madrid (CRTM) jointly with fees for commuter rail, bus transport and light-rail. ^ Montoliú Camps 1996, p. 56. ^ Burgueño 1990, pp. 403; 406. ^ Medialdea, Sara (11 September 2012). "Palacio de Borghetto, la casa del poder". ABC. ^ "Delegación del Gobierno en la Comunidad de Madrid". Ministerio de Política Territorial y Función Pública. ^ "Population statistics at regional level - Statistics Explained". ec.europa.eu. Retrieved 2018-11-28. ^ "Universidad Complutense". Missouri-St. Louis University. July 10, 2006. Archived from the original on July 3, 2006. Retrieved July 10, 2006. ^ "Universidad Complutense de Madrid". UCM. July 10, 2006. ^ "Universidad Autónoma". Universidad Autónoma de Madrid. July 10, 2006. ^ "Madrid Metro". Robert Schwandl. August 17, 2006. Archived from the original on February 29, 2004. Retrieved April 25, 2008. Burgueño, Jesús (1990). "Modificacions del mapa provincial espanyol des de 1834". Treballs de la Societat Catalana de Geografia. Barcelona: Societat Catalana de Geografia: 391–413. ISSN 1133-2190. Montoliú Camps, Pedro (1996). Madrid, villa y corte: historia de una ciudad. 1. Madrid. ISBN 84-7737-057-5. Wikimedia Commons has media related to Community of Madrid.